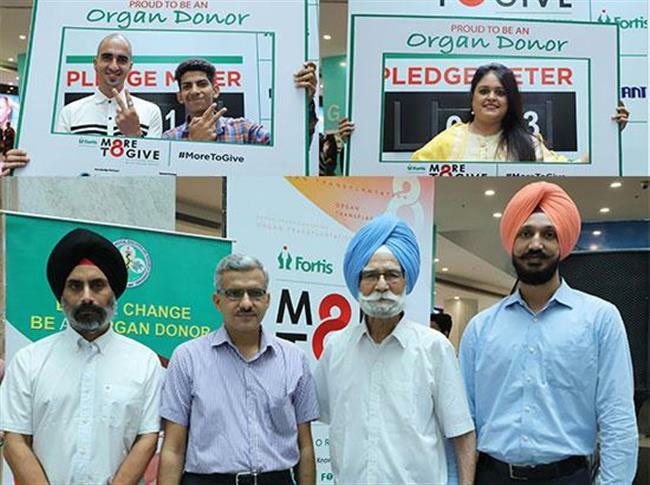 Chandigarh, August 11, 2018: Fortis Hospital, Mohali organized an awareness event to promote the noble cause of organ donation at Elante Mall, Industrial Area here. More than 450 visitors pledged their organs by filling up forms and become the proud organ donors on this occasion. Mr. Balbir Singh, India’s Olympics legendry hockey star, was the special guest on the occasion. The event was part of the commitment towards the cause of creating awareness around the loss of lives that happen for the want of organs. The objective of the same was to generate a dialogue about the cause of Organ Donation. “One can continue to live in this world even after death by donating body organs to the needs and it’s the only donation which can make you immortal,” said Mr Abhijit Singh, Facility Director, Fortis Hospital Mohali. A single donor can save several lives by donating the heart, lungs, liver, kidneys, pancreas and small bowel. By donating organs and tissues, a single donor can potentially save and enrich more than 25 persons, he added. There were Pledge forms/Donor cards available for people to taking the pledge on ground while Fortis, Organ, Mohan Fou­ndation representatives were there to assist in answering queries. A plasma screen was set up to play out facts, myths, etc. around organ donation. There was a Selfie Point, a picture frame cut out with ‘Proud to be an organ donor’ printed on it. Ground audiences were encouraged to take a picture in the frame and put on their social media pages supporting the campaign while the Pledge-o-Meter was set up to add up the numbers of organ donors. There were special guests joining the campaign throughout the day including recipients and donors narrating their stories to inspire people to support the cause. There are extremely low donation numbers in India and there is lack of awareness on the process of organ donation. India has only 0.5 donors per million while there are more than 30 donors per million in many western countries.